Where do you buy filament? I’m almost out of the Flux filament, and I do have another spool that I bought from Monoprice (http://www.monoprice.com/category?c_id=107&cp_id=10724&cs_id=1072402). I’ve been pretty happy with it, but it does seem to melt at a slightly different temp. They have 1 kg for $20 with shipping at about $6-7. Where do you buy your filament? Preferably with links and places that are economical for a good product. PLA Sources: Makerbot and Where Else? I buy mine at a local 3D printer shop. However, if you send a Kickstarter message to the FLUX team, they will sell you rolls of their approved filament. There is no online store yet, but they will send you a PayPal request based on the number of rolls you ask for. I was asking for three spools and was quoted 55$. My postage will be different since I live in Taiwan and am closer to their factory. I’ve used Hatchbox PLA with decent results. A few consistency or color issues, but seldom enough that you could use it for prints that were all day. I plan to make a spool holder for full size rolls, but until then, I’m planning to spool my own 500g mini rolls off of the bigger spools. Also used Taulman products with good results, but those don’t work without a heated bed. Push Plastics is good stuff, but it’s got a rough finish that many people feel weird about. Anything made by toner plastics is good. SeeMeCNC sells their products. I’ve also run BotFeeder plastic, but I’ve not tried their PLA yet. I am actually getting better results from the external spools… But my machine is going back for a number of issues: filament feed inconsistencies is one of them. But when it works, this rack from pipe metal is working well. Room for 8 reels and no catching or jumping. Fast change time. What sort of feed issues were you having? I just got a couple spools of Hatchbox PLA from Amazon yesterday. One spool was having real difficulties with consistently feeding. It kept missing layers and seeming to choke at the filament feed port with all the clunking noises like it was too difficult to pull from the spool (even when extra slack was available). 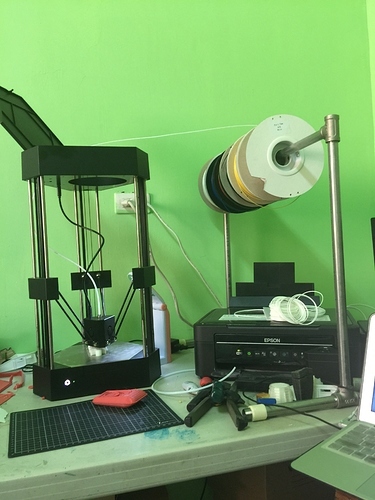 The other spool had almost no problems at all, it worked fine until one layer that seemed to skip in a 13cm tall print near the top. Perhaps the filament is just inconsistent? After removing the troublesome filament, you could feel the tooth marks from the feeder gear, so I’m at a loss for what the problem actually is. Any ideas? That is exactly what I am experiencing - even with the reels of filament from FLUX. They tell me that it is an issue with the machine and not the filament… since it happens with the FLUX approved reels and filament. It is very annoying. Some days I can print two or three models in a row with no problem, then the feeding issue ruins two or three in a row after 3 or 8 hours of printing. Perhaps it is a firmware issue? Well, damn. I don’t feel there’s enough reason to give up on my machine yet, but please keep us abreast of your situation. I really don’t want to send mine back, but it sounds like my problem is not unique. I may end up having to contact team Flux if this continues though. As you said, it is very annoying and doesn’t seem to have any actual physical reason for why it’s occurring. Thanks for the reply! I am sending mine back MOSTLY because it has developed a bad glitch… every once in a while it will simply stop working at all. I turn power off, then turn power on, no green WiFi light at all ever, no re-send position to home, no USB reading, and no USB to computer connection. I have to reboot sometimes 80 times before it returns. Last case was 32 hours. It’s dead now after printing two models, three counting a failed print. I can’t get it back at this time. So I should be getting a replacement unit soon and they really want to take a look at my old one to see what happened. How long has it taken for support to respond and is putting in a support ticket the fastest method? I’m sure mine is DOA, so hope I can get it replaced quickly. Has anybody tried filament from MakerGeeks? Their prices are good, and if one doesn’t care about color you can get 2kg delivered in the US for $33. I got a roll of the Dremel filament at Lowes Hardware, today. I’ll try it out tomorrow evening. Multi-Color 3D Printer Filament 1.75mm/3mm ABS/PLA 1kg/2.2lbs RepRap MarkerBot | Crafts, Other Crafts | eBay! It’s up to 13.99 moments ago, for the “PAL” version, as opposed to the ABS version. Maybe PAL is cheaper than PLA or it’s simply a typo! Yes, apparently the price is pretty much “in flux” (see what I did there) depending on which color and material and even size you choose. I think I paid $13.49 for my spool of “silver”, but that’s just barely more than half the cost for a spool of Hatchbox. As I said, it’s a risk, but it’s up to you. My first 3D Printers were MakerBots, so I first started with their brand of filaments. Then I switched to Prototype Supply and have mixed experiences with them. Then switched over to Hatchbox and really like their filaments. The FLUX filaments I’m happy with too. Once the FLUX store opens I wouldn’t mind buying additional FLUX filaments. One thing I do request is for larger spool sizes be made available. Maybe @Simon can consider this for the store? Full kg reels would be good. I’ve been pondering making a set of brackets to go on top of the FLUX to hold a large reel. There are designs in the works. Other threads and thingiverse flux forum. I just use a pipe stand I made with seven rolls on it. One is a three KG roll of white.